Arvixe Review 2019: Is Arvixe a Good Hosting? 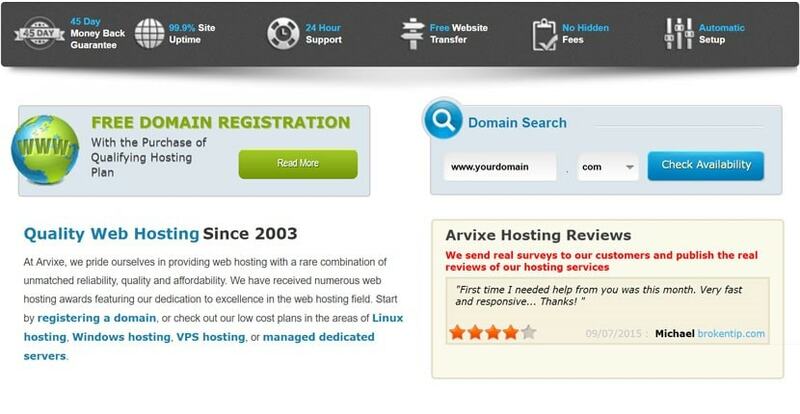 Californian web hosting company Arvixe has been providing its services since 2003. It offers two server locations -- United States and Hong Kong -- as well as a better-than-average money-back guarantee. Arvixe was founded in 2003 in San Luis Obispo, California. It serves an active customer base of thousands of individuals, small businesses, and larger corporations around the world. Arvixe operates out of two data centers in Dallas, Texas, and Hong Kong. Services and support are offered in English. If you have little to no coding knowledge, you may find Arvixe’s website builder rather handy. This allows you to set up a website with just a few clicks, even including hundreds of templates you can choose from. Other than that, you’ll have the Softaculous app installer and either the cPanel or Plesk control panels (depending on the operating system you select). Arvixe also offers support for advanced coding languages such as Ruby on Rails, Perl, and Python. However, PHP support is only up to version 5, which means your scripts and CMS installations may run slower than usual. That said, one thing I did like about Arvixe is that the shared hosting packages include excellent security features, such as brute force detection, redundant carriers, RAID 10 drives, and DDoS attack mitigation. Shared hosting plans at Arvixe are slightly more expensive than average, especially since you’ll have to purchase an SSL certificate separately. However, you do get a free domain registration with your plan, and you can host multiple domains with unlimited storage and data transfer. Arvixe also gives you Google Adwords and Yahoo! Bing credits — all things considered, Arvixe’s pricing is very reasonable. Arvixe also has a 45-day money-back guarantee, which is better than the industry average of 30. Billing terms are quite flexible. You can pay on a monthly, quarterly, half-yearly, annual, or two-year contract basis. The longer your contract, however, the greater the discount you’ll be entitled to. Payment options include credit cards and PayPal. Support channels are limited to live chat, ticket, and email support. Arvixe used to offer phone support, but this has since been discontinued in favor of live chat support. I’m happy to report that Arvixe’s support really is 24/7, as advertised: I accessed their live chat and connected with an agent almost immediately. Arvixe also maintains a blog and a knowledge base. U.S.-based Arvixe may not be one of the big-name providers, but it offers a feature set and customer support that can rival some of its more well-known competitors. That said, it only has servers in the U.S. and Hong Kong, so you may be out of luck if your target market isn’t in either of those two countries. Wondering how Arvixe stacks up against other Web Hosting companies? Enter any other Web Hosting company and we will give you a side-by-side comparison.